New vs. old, now tell me the new one doesn’t do a terrific job of reflecting the old Beetle’s personality! Simplicity is its own reward, but it’s often accompanied by modest cost and a style that stands out in today’s overwrought world.Such has always been the case with Volkswagen’s simply shaped Beetle. 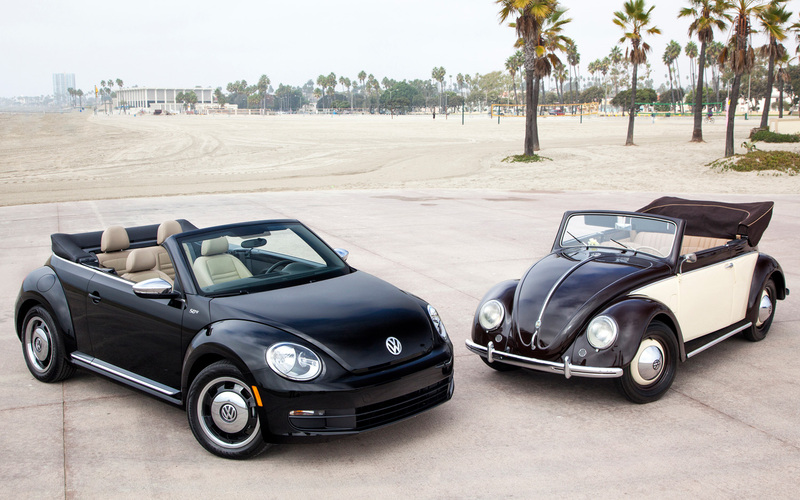 Now comes a new Beetle convertible, replacing the 8-year-old New Beetle convertible. THIS new iteration actually is more in tune with the original, with a less rounded roofline that looks perfect. Yet overall the car has grown 6 inches longer and 3.3 inches wider than its predecessor. 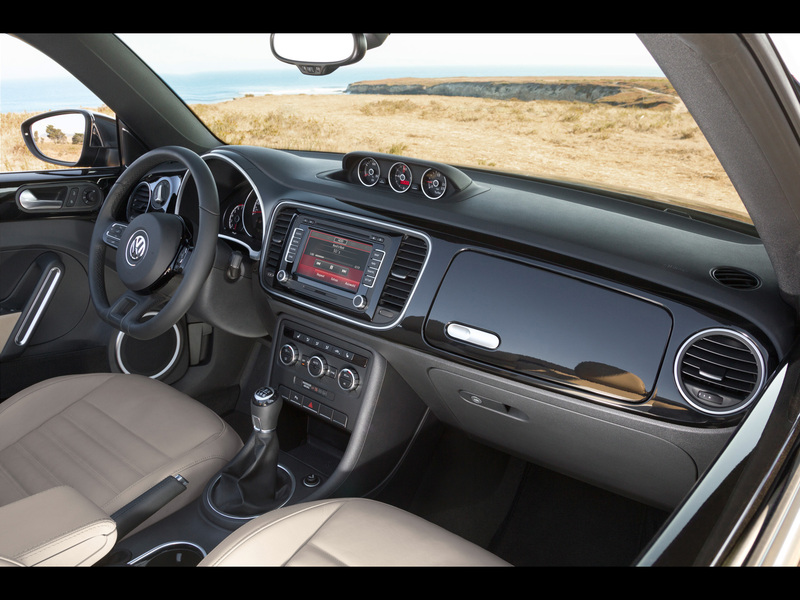 Making this 2013 model all the more tantalizing, VW offers three special decade editions, including the tested 50s Edition bathed in black and featuring key chrome trim along with beige leather seats. This Beetle looks so ’50s-ish you may want to slick back your hair or put on a poodle skirt. This model also adds chrome exterior mirrors, a chrome strip along the car’s lower extremities to remind you of earlier models’ small running boards, and 17-inch chrome Heritage wheels that look much like the simple chrome wheel covers of the 1950s. Not that old? Well, VW also offers a Denim Blue 60s Edition with two-tone interior, and Toffee Brown 70s Edition. They vary a bit on engine and other specs, but include small spoilers. Naturally the key feature is the convertible top, a power unit that requires nothing more than you to push up a switch near the roof over the rearview mirror and in less than 10 seconds the roof folds neatly down behind the rear seat and the side windows have been lowered. It’s quick and easy. Luckily I had this one during one of our rare warm spells this spring and got to drive with the roof down six times. Wind is a bit more noticeable than in a few higher cost convertibles, but then if you want your hair undisturbed, well, you’d best opt for a decidedly less cool coupe. 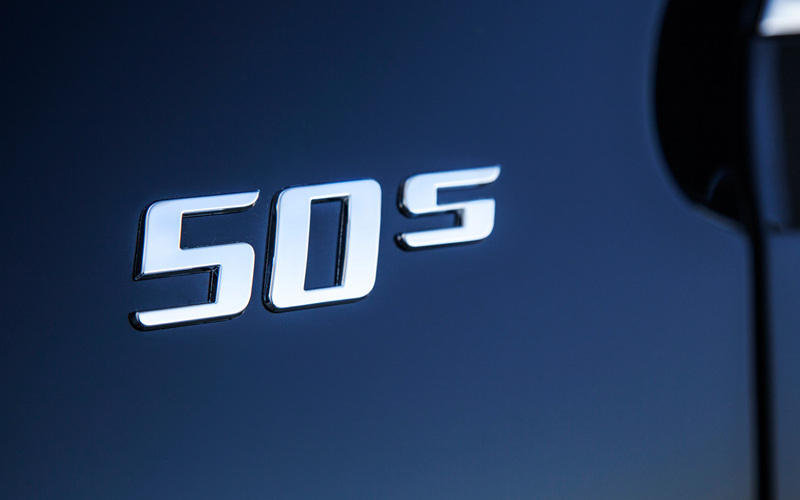 The 50s Edition is a pleasant driver, top up or down. It features a 2.5-liter 5-cylinder that generates a reasonable 170 hp. Power is good, but there’s a lag upon acceleration, that feels like turbo lag even though that’s not possible here. There’s no turbo. More likely it’s due to the gearing in the Beetle’s 6-speed automatic. Like some other cars, the lag is most annoying when you accelerate out of a corner after you’ve raised your foot briefly off the accelerator. Yet the VW makes up for that with somewhat sporty handling and a smooth, well-controlled ride, a bit surprising in a car with just a 99.9-inch wheelbase. The car’s weight, 3,206 lbs., helps in my estimation. It keeps the car well planted and easy to control, even on windy days, something early Beetles struggled with. Handling is light with slight play in the steering wheel. Braking comes from vented discs up front and solid discs in the rear. ABS is standard. Inside, the 50s Edition was quiet and featured no roof vibration, so the car’s overall feel is much higher quality than we came to expect in the late ‘50s and ‘60s. I like this version’s tan leather seats and black dash with gloss black dash face. It’s a retro, yet modern look. Retro, yet modern is how I describe the 50s Edition interior. Creature comforts are fine too, including a tilt/telescope steering wheel with a gloss black hub, flat bottom (gives you more leg room entering and exiting), trip computer controls on the wiper stalk to the wheel’s right and three-level heated seat controls on the center stack’s face. Three climate control knobs are right there on the lower stack and there’s a smallish radio (no nav) screen above those controls. Simplicity reigns, without the nav system, but the radio’s buttons are thin and can be hard to use while driving. Set your station before you get going. Power mirrors and automatic lights are standard, but oddly you must still turn the light knob to illuminate the dash gauges and buttons. So I guess I’d call these semi-automatic lights, as in dark conditions the headlights pop on, but not the dash gauge lights. Seats are a highlight, well contoured and comfortable. They are manually adjusted, but there’s a pump handle on the driver’s seat to raise and lower its height. I also like the rotating dial to adjust the seatback’s angle. Again, simple! As in past Beetles, you’d better plan to toss any luggage in the rear seat, which could only hold small children otherwise. This trunk is a measly 7.0 cubic feet, although the rear seatbacks will flip forward. Dropping the top doesn’t change the trunk dimension either. 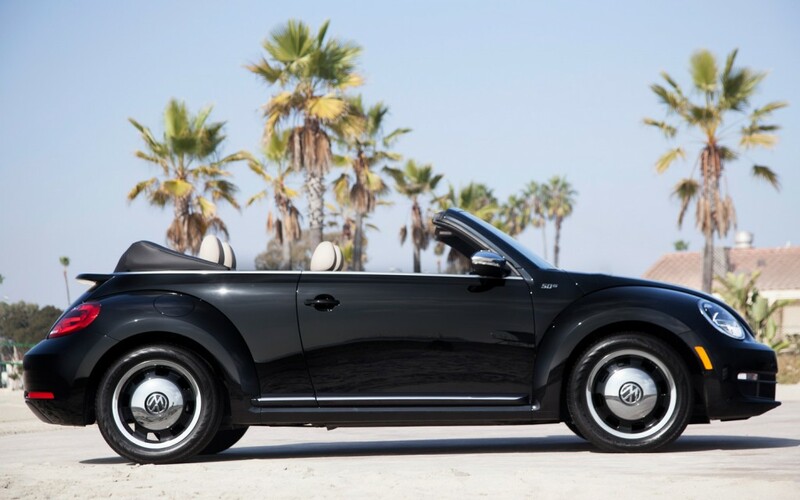 Most Beetle Convertible buyers though are looking for a stylish, fun ride that’s not too tough on the wallet, and surprisingly this is one of the lowest cost convertibles on the market. 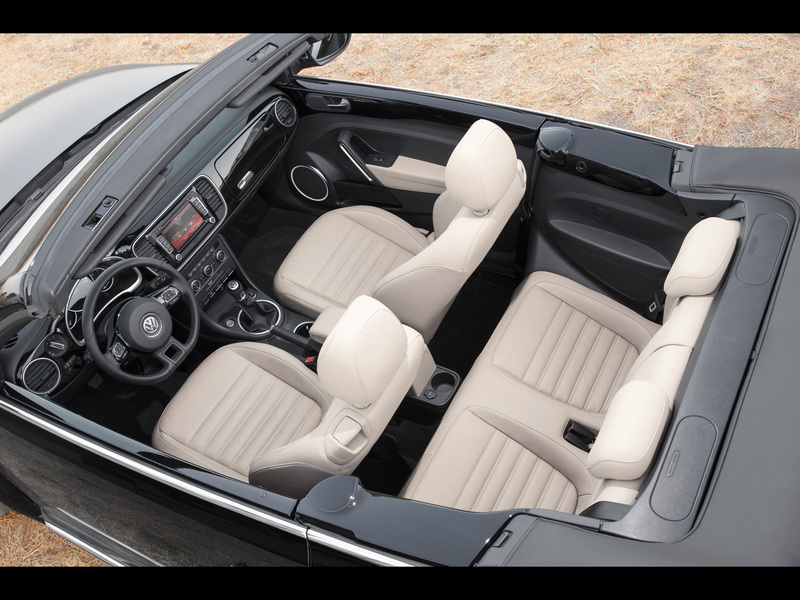 The base Beetle convertible starts at $24,995 and this slightly spiffier test model goes for just a tad more at $26,095, plus a 795 delivery fee. That put this one at $26,890. If you really want a convertible, only Mazda’s MX5 Miata, Chrysler’s 200, and Mini’s Cooper, come close. This is pretty efficient on the roads too. I got 25.3mpg while the EPA rates the VW at 21 mpg city and 27 mpg highway, which seems very doable. If this version doesn’t trip you trigger there are 11 trims in coupe and convertible for the restyled Beetle. Top in the convertible lineup is the Turbo with a special sound and navigation package and either a manual or automatic transmission. It lists for $32,295 with the automatic. That turbo is a 2.0-liter TSI model that generates 200 horses. Diesel lovers can get a TDI 2.0-liter diesel that makes 140 horses, but is heavier on torque, so will feel quicker off the line. And no, turbo diesels don’t smoke and choke you. They run smooth and efficiently. This one is rated 28 mpg city and 41 mpg highway. Beetle is simple in looks, but difficult in that there are so many versions to choose from. Darn the luck! Hits: Cool retro looks, nice handling and ride, flat-bottomed steering wheel, super convertible top powers down easily in 10 seconds, love the chrome trim and mirrors, plus price and gas mileage are reasonable. Misses: Who swiped the trunk?